So we'll take the Washington Post's 'well-oiled machine' comment as a compliment whether they meant it or not and move forward in the days ahead in what we can only call the most important two years in the history of this country dating back to the 2016 election. 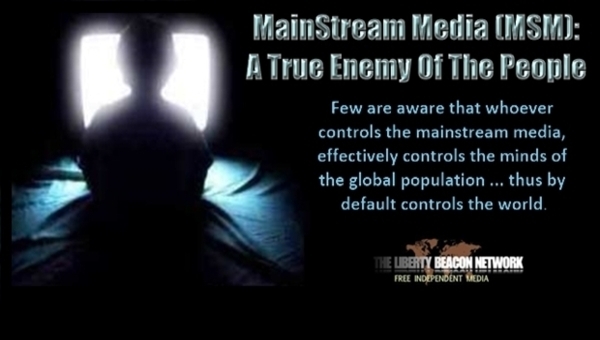 With the globalists 'legacy media' still echoing the Democrats and their talking points and attempting to divide America, we'll attempt to finally exorcise the MSM demons and take back America with the #CovingtonIncident proving President Trump's words true once and for all: The MSM truly is the 'enemy' of the American people. As Zero Hedge reported within this January 23rd story, when full grown adults within the Democratic party, the entertainment industry and the mainstream media demonize a bunch of school children based upon a lie, we've crossed a certain line that may never be able to be uncrossed with children now in danger because of the words and tweets of adults. Fox News host Tucker Carlson called out the adults, some famous and some politicians, who were fantasizing about children being assaulted and murdered and we're extremely happy to see powerhouse attorney's ready to make these folks pay for their hateful and slanderous tweets. With both the Covington Catholic High School and their students now receiving death threats from deranged leftist lunatics based on the lies of twitter social justice warriors and the mainstream media, do they really not see what they have done? As Mike Adams reported within this January 22nd story, the the liberal media is truly a group of demon-possessed anti-human entities, infused with absolute evil and hatred, working to destroy human life, Christianity and the belief in God. Warning within his story that we're now engaged in a spiritual war of universal importance with pure evil having taken over nearly the entire left-wing media, govt bureaucracies, universities, public schools, Hollywood and even the ranks of science and medicine, we'll take a look in the next section below at just how correct Adams is in his assessment. 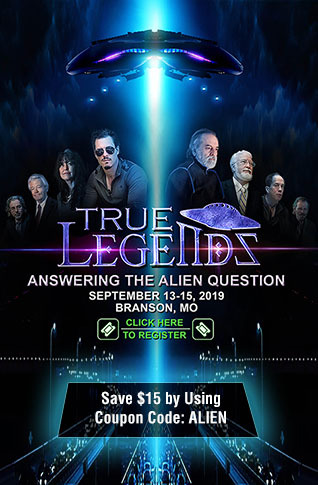 And as Steve Quayle mentioned in an SQnote while linking to Mike's story, "Mike Adams absolutely nails the supernatural demonic control of the msms and Democrats and Republican traitors!" With Covington possibly the straw that broke the camel's back as Susan reported on within this story and liberal media outlets now attacking each other, quite literally eating their own as we see in this story over at The Atlantic launching a vicious attack upon the NY Times, the tide may be turning. But now is the time to keep on the pressure, especially with the Atlantic story saying of the MSM's (and thus their own) Covington failure: "And the damage to their credibility will be lasting." As mentioned briefly above, in this section of this story we'll take a look at what Conservatives and Christians are up against within the media and other fields via several different graphics both above and below taken from this Zero Hedge story, and we really shouldn't be surprised that the media and the entertainment industry have proven themselves to be die-hard leftists. 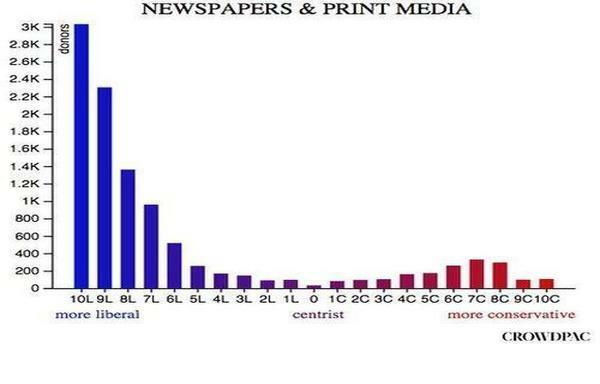 Showing the number of donors to liberal causes vs more conservative causes, the graphic above showing the political leanings of employees within the newspaper and print media prove the argument made by Conservatives of a huge leftist bias within the media. The chart also shows what websites such as All News Pipeline are up against. 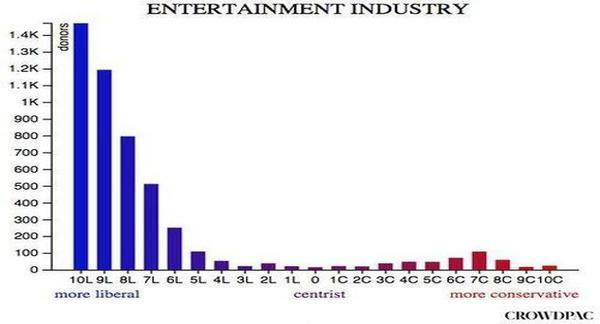 While none of us should be the least bit surprised about the political bias within the entertainment industry as seen in the next graphic above, the next graphic below proves the arguments being made by Conservatives that the university system all across America has been taken over by liberals with donations to liberal causes by such 'professionals' dwarfing those to Conservative causes. 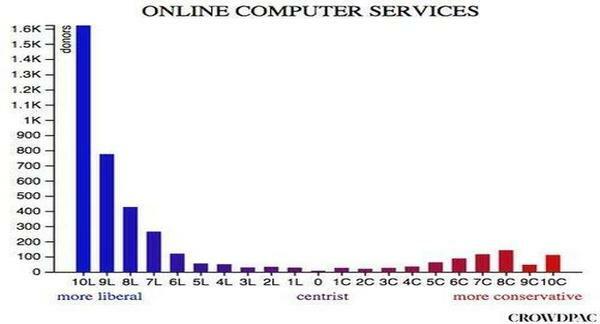 And we're not the least bit surprised in the political bias shown within the majority of online computer services as seen in the next graphic below. As those reading independment media know, outlets such as twitter, facebook, google, youtube and others have increasingly embraced totalitarian standards of 'free speech' and censored Conservatives and Christians. And while those graphics show many of the industries which make majority of their donations to liberal causes and candidates, and those donations largely dwarfing those donating to Conservative causes and political candidates, there are fields that support causes embraced by Conservatives with the fields of Agriculture, Building and Construction, Mining, Oil, Gas and Coal and Real Estate largely leaning to the right. 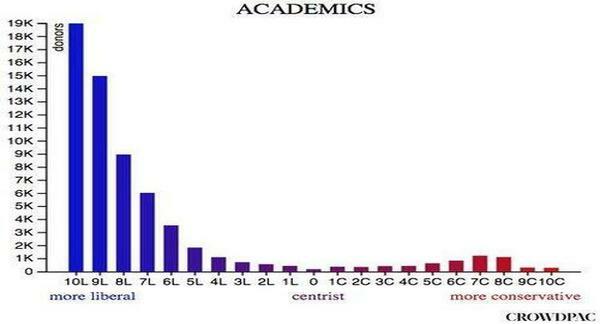 Yet it's the field's dominated by the left within which those 'employees' have the greatest 'reach', whether via the always present television newscasts, the universities and public education socialist indoctrination programs driving our children to new levels of socialist madness, our entertainment industry preaching morals as if somehow they are 'holier than thou' or 'big tech' throwing their enormous weight around, censoring Conservative thought and opinion as if 2020 is the only thing that matters to them and winning by any and every means necessary is absolutely their right. Anybody really believe that the FBI or DOJ will investigate 'big tech' or the mainstream media and their roles in fixing the 2018 mid-term elections in the Democrats favor? The still-ongoing Mueller witch-hunt is just more proof 'the rule of law' is gone forever in America with it always 'bent' in the Democrats favor. Hillary walking free is absolutel proof of that. So Susan and I sincerely thank all of you who have donated to ANP to help keep us in this fight for the future of America, a fight which you can see in the charts above is heavily skewed in the opposite direction. ANP wouldn't be here without you and we can assure you, every little bit helps with 'big tech' and the left trying their very best to silence independent media altogether.